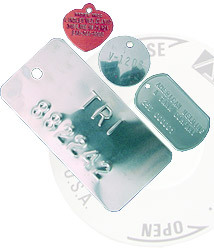 Tags - Etched, Metal & Laser Etched, Nameplates, Tag Clips, ID, Embossed, Valve, Utility Pole, Metal Stampings | BB Tees, Inc. Many different types of manufacturing companies requiring custom Identification products and metal components. Our goal is to offer high quality parts at a competitive price and in a timely manner. We welcome the opportunity to work with you and quote your next project together. To get your project started, please refer to our request for quote page and be sure to attach any drawings or artwork you may have. Also be sure to include any requirements you have such as material, size, quantity and colors so that we can respond quickly with an accurate quote.